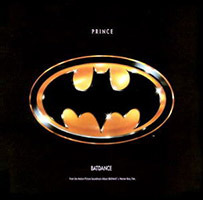 Batdance was the first single to be released from Prince's eleventh album Batman (the motion picture soundtrack to the 1989 Tim Burton movie Batman). It was released two weeks prior to the album, and received a release around the world, becoming Prince's fourth US number 1 single on the Billboard Hot 100 Chart (following When Doves Cry, Let's Go Crazy, and Kiss). It also reached number 1 on the Billboard Hot Black Singles and on the Billboard Hot Dance Music - Club Play charts. On 11 August 1989 Batdance was certified platinum by the RIAA, indicating 1 million units shipped in the US. This single wasn't released on Digital format. The 1989 Tim Burton movie Batman was heavily promoted, and the use of the movie's symbol on the single's cover acted as promotion in itself. The single rotation on US radios started 1 June 1989. Batdance was the seventh single to be certified as a million seller in 1989, reported Billboard on 26 August 1989 (Vol. 101 No. 34).